This instalment looks at evaluating rides, checking they’re progressing accordingly to your goals, and ways of troubleshooting any problems you may come across. Harrogate and back went smoothly. Ilkley and back was shortened to Otley and back (around 20 miles), as I had other commitments on the day. Note: as these are routes I’m familiar with, I’ve not been using Strava for navigation so they’re not recorded online. My bike was out of commission for the next ride; I had to replace the whole rear gear mechanism which is never a welcome interruption. Haworth and back has been rejigged to a ride up to Hawes to compensate for the lower-than-planned mileage so far (60 miles instead of the planned 50). Learnings from this: flexibility is an important part of training. If it becomes a source of stress it can be counter-productive, and my logic is that is long as I’m building up to the point where I can tackle distances / elevations representative of those on the Ride25, the training is successful. The first thing to do is check you’re eating and drinking enough before and during your ride. 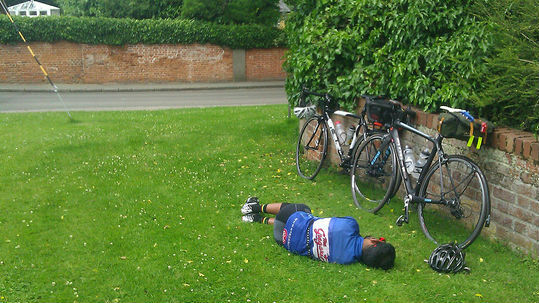 We’ve written before about bonking (not that kind), and the energy slump caused by the lowered energy levels can catch even the most seasoned cyclist off guard. Simple carbs such as energy gels (with water), sweets, sugar cubes or similar sugary snacks are the best course of action if you feel a bonk coming on. More complex carbs like flapjacks, energy bars and nuts are good for eating during your ride to keep a steady supply of energy. If you were sufficiently nourished and hydrated but still had trouble completing your ride, perhaps this may be a sign that you should aim for shorter rides and build up more gradually to the point you’re attempting. The distance is fine – I’m just struggling on hills! If you find yourself struggling mentally, just think of the downhill that awaits you! If you need to, have a rest at the top. You’ve earned it! If you aren’t already, familiarise yourself with cadence. This is the concept of maintaining the same RPM through your whole bike ride by adjusting the gears accordingly. The idea is to keep the activity your body is doing as consistent as possible . Road cycling can be daunting and can quickly sap the enjoyment from your rides. If the routes you’ve planned are taking you along roads you find too busy, make a note of where these roads are during the ride and adapt the routes accordingly afterwards. Cycling can lead to a selection of maladies: Achilles tendinitis, patellar tendinitis, saddle sores, blisters, and all sorts of anonymous aches and pains. The best way to avoid these is to have your bike set up correctly. Saddle height can have a huge impact on your cycling technique. Too low and you risk straining your quadriceps and patellar tendon, too high and your foot may not have an opportunity to dorsiflex (i.e. your toes will stay pointing downwards for the whole revolution) which can strain the Achilles tendon. Saddle sores are caused primarily by friction in the region, which can be exacerbated by wearing the wrong materials (avoid ones that hold onto sweat, like cotton) or allowing sweat to dry (this causes the salt to reform into crystals which can have a similar effect to sandpaper!). Wearing cycling shorts and keeping clean between rides is the best way to avoid this issue. Also remember that as you cycle more often, your tissues will adapt and you’ll be able to ride for longer without getting sore. I had the opposite problem – my ride was too easy! In that case, identify where you want to improve most and alter your ride accordingly! If you want to get better at climbing, add more hills. If you want to improve endurance, take a longer ride. And above all, embrace this feeling! There will have been a time when you found this ride too difficult, so remember to allow yourself a burst of pride for passing that point. If you’re having any other problems with rides, ask us in the comments below and we’ll do our best to help! In the meantime, enjoy your training and look out for part 5 (the final part!) about other exercises you can be doing alongside your training rides. Top image by Phil Gradwell, used under Creative Commons. Source. Cycling is not an easy. When I was taking training, it was very tough for me.